14 color scenarios on cardstock, 12 page booklet, 1 8" x 22" unmounted geoboard (LFT2, a fixed version of the map originally appearing in Le Franc Tireur 12). 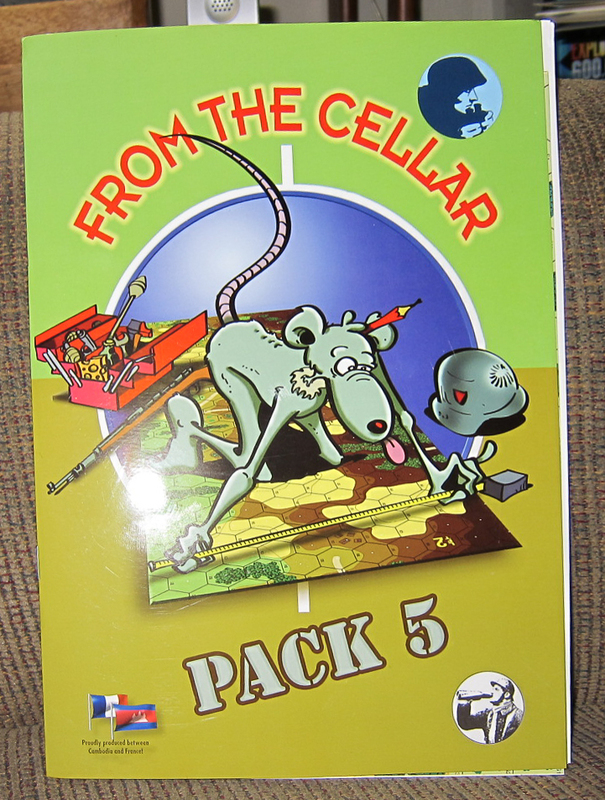 From the Cellar Pack 5 (FtC5) returns to the early traditions of the series after a two-pack departure in which outside designers contributed the material. 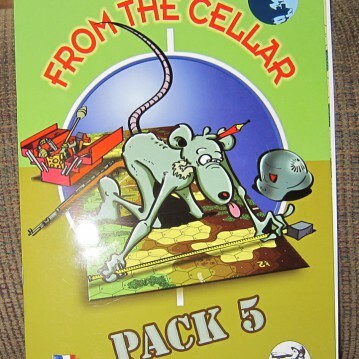 As in the first two Cellar packs, the scenarios in FtC5 primarily consist of leftover scenarios originally designed for Le Franc Tireur magazine. As such, they tend to concentrate on recent topics in that magazine, such as China, France 1940, and the Spanish Blue/Azul Division on the East Front. FtC5 does contain some non-scenario material. 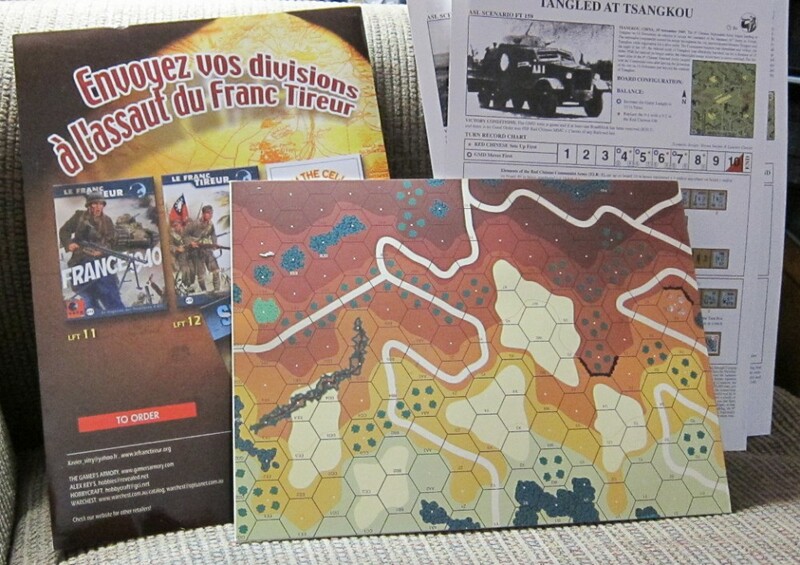 One item is board LFT2, a fixed version of the geomorphic mapboard that originally appeared in Le Franc Tireur #12, where it was printed slightly oversized; see that issue for more discussion. Two scenarios in FtC5 use this board; one, FT154 (First Defeat), also uses another LFT map, board LFT1, which appeared in Le Franc Tireur #11 (and which was also slightly misprinted, but never fixed). The other is FT158 (Close Combat Teams), which also uses ASLSK board v (scenario FT159 [Tangled at Tsangkou] also uses board v). 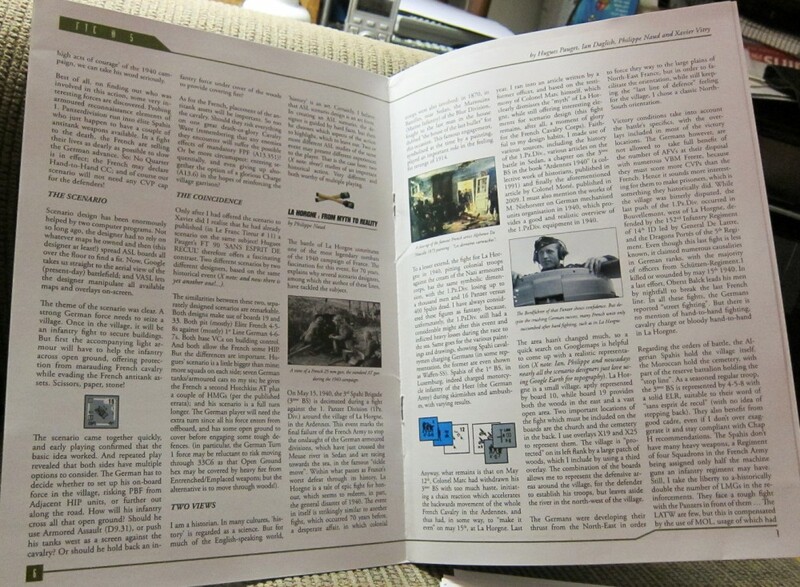 In addition, FtC5 contains a 12-page booklet that basically has two articles with designers notes about the genesis of three of the scenarios in the pack. Actions in the pack take place in a variety of settings (some of them rather exotic), including China 1935 (Guomindang vs. Communists), Mongolia 1936 (Mongolians vs. Japanese/Manchurians), France 1940 (French vs. Germans [4 scenarios], Soviet Union 1941 (Soviets vs. Italians, Soviets vs. Germans [Spanish]) and 1943 (Soviets vs. Waffen SS), New Guinea 1942 (Australians vs. Japanese), Finland 1944 (Soviets vs. Germans), France 1944 (Canadians vs. Waffen SS), China 1945 (Guomindang vs. Communists), and Manchuria 1945 (Soviets vs. Japanese). As can be seen, a number of these are off the well-trod and beaten paths of ASL, and thus provide some freshness and novelty, while there are still enough actions on “tried and true” ASL subjects to satisfy the more conventional and hidebound ASLers. The scenarios represent a well-balanced mix of small, medium, and larger actions; players can get anything from small and fast playing scenarios to more meaty actions that can take a whole day to play. One scenario, FT147 (Flight of the Intruders), uses Steppe Terrain and desert boards. Two scenarios use Night rules, while three scenarios have OBA. Interestingly, 4 of the scenarios feature Cavalry and 2 scenarios feature Motorcycles. The scenarios include a number of interesting actions, as well as some less so. FT146 (Bridge of Life) is an example of the latter; while it might be considered when players don’t have much time, it is simple and doesn’t have much replay value. FT153 (Nailed to the Ground) is also not very attractive; taking place on less than half a board, it pits 15 Soviet squads of indifferent quality against 4.5 German squads and some minefields. With scenarios like this, in which one side has so few forces to set against the other, the smaller side is particularly vulnerable to an unlucky combat result or sniper attack. The German player must roll dice and hope for survival. On the other hand, there are a number of scenarios that look quite interesting. FT147 (Flight of the Intruders) has a lot going for it on novelty value alone. It represents one of the border clashes the Japanese had in the mid to late 1930s between their forces in Manchuria, as well as their puppet troops, with Soviet forces, or Soviet puppet forces. This action, which uses desert boards and Steppe Terrain (as well as ground snow), depicts an attack by Japanese troops and their Manchurian (“Manchukuoan”) puppet troops against troops from the Soviet puppet government of Mongolia. The Manchurians are represented by 1st line Axis Minors on horseback; the Mongolians by Soviet counters (but treated as partisans). Though the victory conditions are somewhat too complicated, the situation is still an interesting one. FT150 (Storm over Champagne) is nice because it uses three boards that collectively depict an entire village surrounded by farmland on all sides. In this Franco-German scenario, both sides must exit units off the opposite side of the map; thus while attempting to exit they must prevent the other side from doing the same thing, which poses an interesting tactical puzzle. If both sides fail to exit a minimum number of VP, then victory will go to the side with the most CVP. The two sides are basically equal in force; the French have 13 squads, a gun, and 5 tanks; the Germans have 11 squads, two guns, and 7 tanks. Because of the VC and the large map area, there are several different strategies possible and the scenario has some replayability. 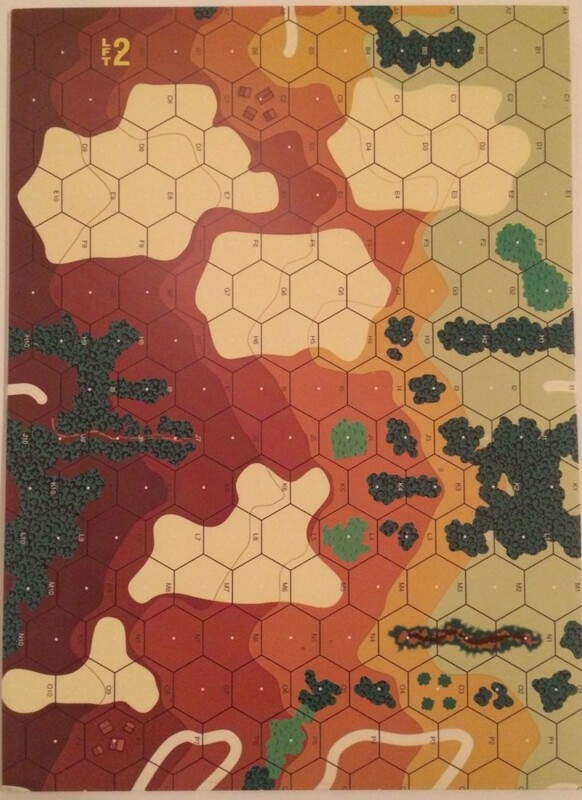 Because of the fairly large number of vehicles, the large map area, and limited anti-tank capabilities for both sides, a number of playings of this scenario may see both players exit their required minimum VP amounts, mostly or totally through vehicles, turning the struggle into a tussle for CVP. One tournament-sized scenario that went down the the last DR in this writer’s first playing of it was FT152 (Avanti! ), a 1941 East Front action depicting an Italian attack (with some German help) and a Soviet fighting retreat. The action takes place on Board 16, which is nothing but open ground, grain, and three buildings. To win, the Italians must control all the buildings and also have more CVP than the Soviets (but only Italian units, not German units, can gain control of a building). The Soviets are forced to set up away from all three buildings, in a narrow area consisting mostly of wheatfield. They must both hold back the Italians while at the same time getting units into the key buildings to defend them. The Soviet force initially is of quite poor quality, but they get a platoon of reinforcements, as well as two armored cars, which can make all the difference. The armored cars can park behind a key wall and get wall advantage, too. The Axis have only MGs and a German ATR as anti-tank capability. The scenario is somewhat dicey, as both sides must cross open ground or sit in 0 TEM hexes, but poses challenges for both sides. FT154 (First Defeat) uses the two LFT mapboards, one a narrow beach strip and the other a steep and large hill, to depict the New Guinea coastline at Milne Bay, where a small, ill-fated Japanese force landed in an abortive attempt to take the Australian airfields there. Several sharp clashes occurred along the coast during this campaign, but ASL geoboards could not easily do them justice. However, the LFT boards manage to do a much better job. In this Night scenario, 13 Japanese squads, 2 guns, and two tanks (with headlights!) attack an Australian force of 14 squads, well led and well armed. FT155 (One Upon a Time…in the East) is a sort of “classic” East Front action. Set on three full boards (mostly open) covered with snow, this scenario depicts a meeting engagement (relatively rare in ASL scenarios) between Waffen SS forces (one group of 6 squads and 2 armored cars, another group of 8 squads and 3 tanks) and Soviet cavalry (one group of 8 squads, another group of 8 squads and two tanks, with two more tanks arriving a tad later). Both sides get CVP as well as VP for buildings (on one board); the Soviets also get exit VP. 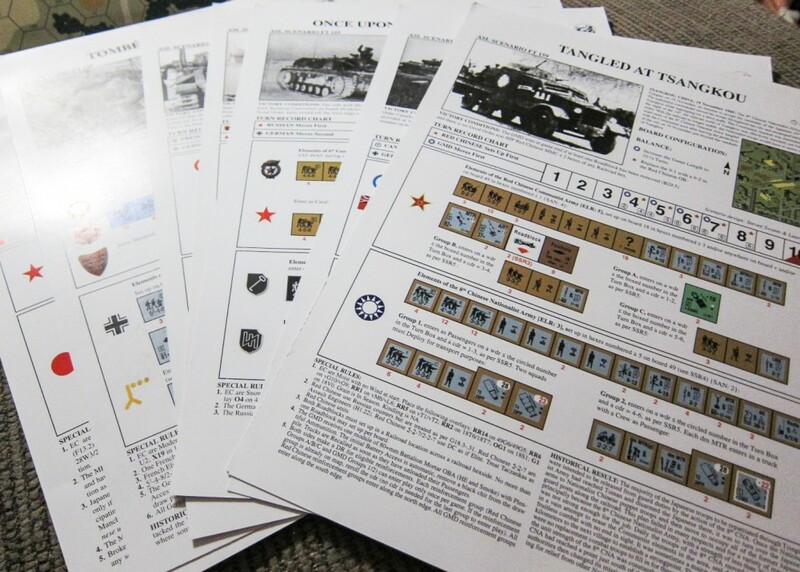 Meanwhile, fans of the Far Eastern front can play FT158 (Close Combat Teams), which uses board LFT2 and ASLSK board v to create a Manchurian hillside position for the Japanese defenders (who get 15 squads, 2 guns, as well as mines, trenches, foxholes, and pillboxes). The attacking Soviets have 19 squads (including an FT and 2 DCs) and 10 AFVs, plus some OBA. To win, they have to exit 33 VP. The “Big Momma” scenario in FtC5 is FT159 (Tangled at Tsangkou), a large (3 map) 10-turn scenario depicting a major Chinese Nationalist (Guomindang/Kuomintang) vs. Chinese Communist clash in north China just a few months after the end of World War II. In this scenario, the Nationalists have 38 squads, with a variety of SW and some OBA, as well as two armored cars. The defending Communists have 24 squads (partisans), 3 guns, and two taczankas. The Nationalists must clear a railroad that runs across the map, while the Communists must somehow hang on to a bit of it. Overall, the pack has a lot of interesting and varied actions, with scenarios suited to fit a variety of tastes. Assuming they have been thoroughly playtested (the scenarios have not been played very much since their release, so ROAR provides little guidance), some of these might prove popular. It’s definitely worth a look at this pack.